Air Science introduces the new Purair® BIO to the market. The Class II Type A2 biosafety cabinet (BSC) has been redesigned with simplicity and user comfort. Constructed without costly, complex microprocessor controls, the Purair BIO offers assures easy operation with low energy consumption. Engineered for safety, the Purair BIO is available 4 standard sizes in your choice of NSF 49 and EN12469 certified models. Performance – The Purair BIO ensures personnel and product protection through precisely tuned and tested airflow patterns. It maintains a standard airflow ratio of 70% recirculation to 30% exhaust to ensure operator protection. The BIO can be configured to comply with either NSF 49 or EN12469 standards for airflow. Improved Efficiency – Designed with a single blower motor, the BIO eliminates airflow problems common with dual motor designs and delivers easy, reliable, and energy efficient operation. The energy-efficient brushless EC Brushless DC Motor ensures sufficient airflow across the work surface at all critical points while reducing energy consumption by more than 80% when compared to traditional motors. Inherent Contamination Control – VIRO-CUT™ Antibacterial Stainless Steel is used throughout the cabinet interior for latent germicidal protection against most airborne contaminants. Slim-Profile Design – The slim profile cabinet is one of the narrowest on the market. The compact width allows easy passage through standard doorways for easier installation and relocation. 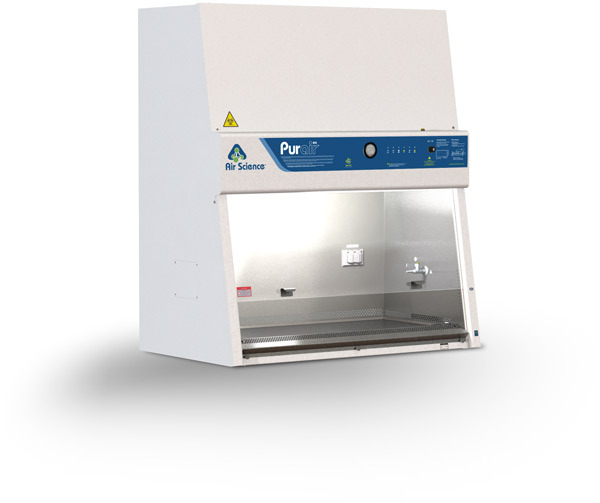 If you're looking for an economical biological safety cabinet that meets NSF Class II, Type A2 contact Air Science today to request a quote for the Purair BIO Biological Safety Cabinet. Purair BIO cabinets provide ample workspace with environmentally sound operation. Flexibility - Multiple service connections offer maximum flexibility. The Purair BIO includes duplex electrical outlets with splash-proof, UL listed covers. CSA certified service valves for gas, air, and vacuum are available. Operator Safety - The anti-ultraviolet, 6 mm tempered glass ensures maximum protection for the operator. Ergonomic Design - The user interface combines ergonomics, safety, and aesthetics with a 10° angled window design that reduces operator head and elbow discomfort, as well as eye strain and fatigue.